Faith News Network » Cremation: The Believer’s Option? Members of the Church of God Doctrine and Polity (D&P) Committee have released a paper with extensive research on the topic of cremation. The paper was written by Dr. Jerald Daffe, a member of the D&P Committee and professor at the Lee University School of Religion. The paper is the fourth released by the D&P Committee. 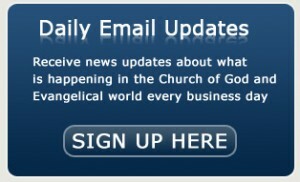 Previous papers are located on the Church of God website (www.churchofgod.org) under the BELIEFS tab on the home page. They are also available in Spanish at the site. The Doctrine and Polity Committee exists to routinely examine the belief statements, doctrines, and polity in place within the structure of the denomination. The group considers amendments reflective of modern culture and offers recommendations for modifications employing extensive biblical research. Serving alongside Daffe is a group of ministers, scholars and academicians. Second Assistant General Overseer Dr. J. David Stephens serves as executive liaison to the committee. The International Church of God, Cleveland, TN. neither suggests nor mandates any certain procedure for body interment. Burial practices are left to the discretion of the believer and their cultural pattern. The intention of this article is to provide information to assist individuals prior to and during the difficult event of death. Does the believer have options for interment of the body other than earth burial or placing in a mausoleum? The question appears to be asked on a more frequent basis as the percentage of cremations to burials has increased significantly in many countries. In the United States, the National Funeral Directors Association’s “2016 NFDA Cremation and Burial Report” recorded a 32.3% of cremations in 2005 with a projected 51.6% in 2017. This is much lower than the 68.4% of cremations in Canada in 2009. However, in the previously mentioned report, the NFDA has projected the United States percentage to be 71.1% by 2030. “International Cremation Statistics 2014” reveals even higher rates of cremation. Consider this random sampling: Japan (99.9%), Nepal (95%), Taiwan (92.5), South Korea (81.6), Denmark (76%), Sweden (70%). Reason for this will be addressed later in the article. Any consideration of the believer’s option must begin with asking, “What does the Bible teach?” There is no defined statement on the means to be followed. We understand that our bodies are the temple of the Holy Spirit. They house the soul and spirit during life. There is dignity in human flesh in spite of its not being immortal. It provides the means for us to accomplish the will of God here on earth and worship our Heavenly Father. God made human bodies from earth (Genesis 2:7) and upon death they return to the earth. In the future, believers expect a bodily resurrection. We will be then clothed in a glorified physical body without all the limitations of being human. In 1 Corinthians 15:15-49, we are provided with the most detailed statement of the bodily resurrection. Yet, “the exact process by which God will physically resurrect the decomposed and scattered bodies of the faithful is not fully explained” (David Jones, “To Bury or Burn? Toward An Ethic of Cremation” JETS 53/2 (June 2010) 335-47). Occasionally, individuals express concerns as to how there can be a bodily resurrection for those who have been consumed by animals, burned by fire, or disintegrated by explosions. Athenagoras, a second century apologist in Athens, offers a perspective on this in his On the Resurrection of the Dead. Having indicated it is the Divine power which initially gave shape to our bodies he then responds to the ability of the same power to bring together the unrecognized and give life to what had no life. That same power can reunite what is dissolved, and raise up what is prostrate, and restore the dead to life again, and put the corruptible into a state of incorruption. And to the same being it will belong, and to the same power and skill, to separate that which has been broken up and distributed among a multitude of animals of all kinds which are want to have recourse to such bodies, and glut their appetites upon them. The bottom line continues to be that there is no limitation of God’s ability to fulfill His word regardless of the setting which brings death to a believer. In Scripture there are numerous references to earth burial and caves being used for tombs. Abraham’s family members are buried in the cave (tomb) he purchased upon Sarah’s death (Genesis 23:3-18; 25:9; 35:29; 49:31; 50:13). The burials of Joshua (Joshua 24:30), John the Baptist (Matthew 14:12), Lazarus (John 11:17, 18), and Jesus (John 19:38-42) provide further examples. These examples are not to be seen as biblical mandates for burial practice, but rather reflect the cultural patterns of that time. Not to be overlooked are the references to cremation or at least partial cremation. None of them are part of a positive environment (1Samuel 34:11; Amos 2:1-3; 6:8-11). There is also the punishment of Achan which included bodies and possessions being burned (Joshua 7:15, 25). Once again, these examples are not to establish funeral practices. They simply record events which occurred in an environment of desecration and judgement. A brief historical review indicates a contrast between the Judeo-Christian view which places value on the body due to an emphasis on the resurrection and the pagan religion’s concept of annihilation, no life after death. In modern times various atheists have chosen cremation in their ill-fated attempt to prove there is no God. The Christian commitment to earth burial is especially emphasized during the reign of King Charlemagne, ruler over the Franks (768-814), when cremation was declared to be a capital offense punishable by death for those who cremated a body. In the latter 19th century (1886), the Roman Catholic Church officially banned cremation in canon law. Seventy-seven years later (1963), this ban was lifted by the Second Vatican Council. Then in 1997, U.S. bishops were given permission for cremains to be part of a funeral mass. Protestant churches have tended to be rather silent concerning burial practices as their members and adherents regularly have chosen earth burial. At the time of committing the body to the ground the familiar phrases, “dust to dust, ashes to ashes” or some close variant were spoken and then followed with an emphasis on the resurrection. Further consideration must be given to an understanding (definition) of cremation and the reasons for its growing popularity. We begin with a short explanation of the process. The body is taken to a crematorium where it is placed in a furnace and incinerated at temperatures which vary between 1400 to 2100 degrees. This vaporizes the skin, flesh, and muscles leaving only the skeletal remains which are then pulverized. This fine dust (cremains) is then disposed according to the deceased or family members wishes. They may be placed in an urn within a columbarium, scattered at a special place, even placed in several smaller urns or types of jewelry so every member of the family can have their sense of memory and closeness. Special note needs to be included here. Cremation does not mean there can be no funeral or memorial service. Rental caskets are available so the deceased’s body can be viewed to further emphasize the reality of the death and a regular funeral observed. Or, a memorial service can be held with the urn of cremains or a picture of the deceased in the location where a coffin would normally be located. Reasons for the growing popularity of cremation are multiple. A major one is the lesser cost of cremation in comparison to a regular funeral. If direct cremation is chosen (no services), the cost is greatly reduced. In both settings there is a cost reduction of thousands of dollars. Another reason for cremation stems from there being limited cemetery plots. In some countries with limited land areas, it is impossible to have earth burial for all of its citizens. Even when coffins are stacked in burial plots the problem persists. Some countries stack coffins in a burial setting and after a set period of time cremate them. Cremation becomes preferable in highly populated areas in which burial plots are extremely expensive or many miles out into the country. It also relates to family plots which want to be used for generations but are restricted by limited space. A third reason which some present is that burial pollutes the earth. Decomposing bodies leak into the water system. This problem is easily handled by the use of sealer coffins and burial vaults. However, not all areas in the United States and other countries have this requirement. The fourth reason for consideration relates closely to the first one. Cremation simplifies the funeral process. No need to select a coffin or burial plot (which is traumatic for some families). There is no need for a processional to the interment location which is becoming more difficult in heavy traffic areas. All this in turn results in reduced costs to the family. Not to be overlooked is the perspective of the deceased’s family. Some have great difficulty in accepting the vaporization and pulverizing which is part of the cremation process. Because of this it seems vital for the choice to be discussed with family members and all coming to an agreed conclusion. Decomposition over a period of time appears to be the desired, normal process for them. (Even though cremation can be viewed as simply speeding up the process.) It is also important to be aware of the laws concerning cremation in your area. Does the deceased’s will stating cremation supercede the family’s wishes? In the case of the death of a parent, do all the siblings have to agree to the cremation? These questions are easily answered by one’s chosen funeral director. So we return to the initial question. Is cremation an option for the believer? From a biblical perspective the answer is “yes”. As believers, we know that after living a Christ-exalting life and finishing our earthly existence we have the assurance of a bodily resurrection regardless of how our earthly body has been put to rest. When it comes to the final interment of one’s body that decision rests with the individual and one’s family.